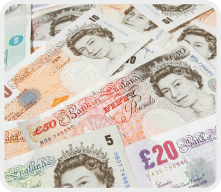 A study has just been published in the BMJ on the effects of financial incentives on smoking cessation in pregnancy. Tappin et al. (2015) conducted one of the first studies of voucher-based reinforcement for health related behaviour change in the UK, and the findings have generated considerable media coverage. Tappin et al. found that more than twice the number of pregnant women in an intervention group given vouchers for stopping smoking managed to quit (69 or 22.5%) compared to a group given standard smoking cessation services (26 or 8.6%). This is a large improvement over existing smoking cessation treatments like nicotine replacement therapy, etc. I've always been interested in the applications of the principles of reinforcement, derived from operant conditioning, to the treatment of health related behaviour change. For several years, I've taught undergraduate and postgraduate classes on the topics of "incentive therapy" or "voucher based reinforcement" or "contingency management" (CM) or a host of other terms used to describe the same approach (I'll use these terms interchangeably). And, I've often wondered why it has taken UK researchers so long to adopt these protocols, which have been proven to be effective at reducing problematic behaviour, such as substance abuse (e.g., here, here and here), increasing medication adherence (e.g., here and here), attendance (e.g., here), and for increasing healthy behaviour (e.g., here) in other countries around the world such as the USA. So, the present trial is to be welcomed. It joins a handful of other such studies from UK based researchers on contingency management for vaccination adherence/substance abuse (Weaver et al., 2014) and breastfeeding (Relton et al., 2014). There are, however, some unique features to this latest UK based research which I think warrant further consideration, and hopefully, funding. "First, the clinician arranges the environment such that target behaviors (e.g. drug abstinence, clinic attendance, medication compliance, other behaviors) are readily detected. Second, tangible reinforcers are provided when the target behavior is demonstrated, and third, incentives are withheld when the target behavior does not occur." (p.9). These three steps must be present for a study to constitute an example of contingency management incentives. This isn't just an academic point; these tenets describe how operant conditioning procedures, and in particular reinforcement, are implemented. If one or more step is missing or changed, then it's not an instance of voucher reinforcement CM. Another defining feature of voucher based reinforcement studies is the use of escalating schedules of reinforcement. These schedules initially provide a fixed sum, say a £10 voucher, contingent on the presence of the target behaviour (in this case, the absence of objectively verified breath carbon monoxide, CO). The next time the criterion for reinforcement is met (e.g., CO levels under a certain parts per million threshold, for instance) it is followed by an increased quantity of the reinforcer (£15, for example). This quantity increases as the criterion for reinforcement is met again across successive sessions, but crucially it resets the moment criterion is not met. So, if CO levels above the set threshold are detected (i.e., the target behaviour is absent), the schedule resets to the original value and the participant has to once again meet criterion to start earning vouchers again. The escalating schedule requires multiple opportunities to earn reinforcement, so repeated measurement of the target behaviour is crucial (e.g., here). On (re-)reading the procedures of Tappin et al., it appears that, strictly speaking, they did not employ an escalating schedule and did not undertake multiple, repeated assessments (other than just 3 sessions). The intervention group received £50 if they attended their first face to face consultation and set a date to quit at the outset of the trial. Note that there were no contingencies in place for abstinence at this stage. Four weeks later, smoking status was confirmed with a CO breath test. If the test was < 10 ppm CO, then a further £50 voucher was earned. Twelve weeks later, those who has quit smoking at four weeks were again contacted and provided a CO2 test. If abstinent, a £100 voucher was earned. Then, between 34 and 38 weeks’ gestation, self-reported quitters were once again asked to provide a CO2 recording, and if abstinent they earned a £200 voucher. Although the magnitude of reinforcement remained the same from session one to two, it increased in the third and fourth assessments but it did not reset to zero contingent on a positive breath test (i.e., > 10 ppm). There were also only three opportunities available to earn vouchers (apart from the first session, where £50 was available but it was not contingent on any objective health related behaviour change, just showing up at the session). Moreover, the three CO measures were obtained from only those participants who self-reported quitting, and we all know how unreliable self-reports can be. In the intervention group, vouchers were contingent on CO readings of <10 ppm. At the outset of the study, however, inclusion criteria consisted of CO levels of at least 7 ppm, which “indicates current smoking” status. No further justification is given for the use of <10 ppm or 7 ppm, and only participants' baseline ppm levels are reported. Let's look at the ppm readings: not surprisingly, levels did not differ between the intervention and control groups (13.65 and 13.14 ppm, respectively). These are high levels and suggest that all participants were heavy smokers. Subsequent analyses of CO ppm are not provided, other than numbers of participants who were ‘CO negative’. So, why not target similar levels in the study? Or why not justify < 10 ppm? Clearly, participants in the intervention group could meet criterion for reinforcement with CO levels of 9 ppm, which is an obvious improvement but perhaps not worthy of such concerted attention? Why not differentially shape a reduction in breath CO levels? A study from the applied behaviour analysis literature did precisely this in a changing-criterion design with individuals with developmental disabilities (see here). But, I digress. Previously, Heil et al. (2008) have used a threshold of CO < 6 ppm from week 3 of their study (with breath CO levels the key criterion for reinforcement during the initial 5 days of the smoking cessation intervention) and, critically, vouchers were contingent on urine-cotinine levels of <80ng/ml, which required “a longer duration of smoking abstinence than breath CO” (p.1011). Higgins et al. (2010) used the same levels. In the Tappin et al. study, urine-cotinine was also measured but just once at the end of the study, which was at 34-38 weeks’ gestation and there no contingencies were in place for high or low levels. That is, voucher reinforcement was only in effect for CO ppm, not for urine-cotinine, and that was at three fixed points separated by extended periods of time. The urine-cotinine data of Tapping et al. showed however that 80% of the self-reported quitters (only 14 women) had in fact quit during pregnancy. This is an interesting secondary measure, but it remains unclear why urine-cotinine was targeted more often during the study and why a threshold of <10 ppm was adopted. Self-report measures constituted several of the secondary outcome measures, but other, objective measures were also reported. For instance, the birth weight of babies born to mothers in the different groups was recorded because previous research (Heil et al., 2008) has shown this to be a sensitive measure of intervention effectiveness. In Tappin et al., the mean birth weight (3140; SD = 600) in the intervention group versus a mean of 3102 (SD=590) in the control group did not differ statistically, and nor did the number of miscarriages (intervention group (M=2, SD=.7) compared to the control group (M=5, SD=1.7). This is disappointing, particularly as other studies (e.g., Heil et al., 2008, Higgins et al., 2010) have found positive effects on birth outcomes and reductions in miscarriages. It is possible that these differences were due to the delayed contingencies, infrequent assessment and partial escalating schedule employed (although further research and lot of grant funding is needed to test this!). Hoddinott P, Hislop J, Morgan H, Stewart F, Farrar S, Rothnie K, et al. Incentive interventions for smoking cessation in pregnancy: a mixed methods evidence synthesis. Lancet 2012;380:S48. I couldn't find a References section for this article so with a little more detective work I unearthed a survey, also by Hoddinott and colleagues, of "public acceptability of financial incentives for smoking cessation in pregnancy and breastfeeding" published in BMJ Open in 2014. Chamberlain C, O'Mara-Eves A, Oliver S, et al. Psychosocial interventions for supporting women to stop smoking in pregnancy. Cochrane Database Syst Rev 2013. (10):CD001055. Higgins ST, Washio Y, Heil SH, et al. Financial incentives for smoking cessation among pregnant and newly postpartum women. Prev Med 2012;55(Suppl):S33–40. Two of these are review articles (Chamberlain et al. and Higgins et al.) while the other article is the meeting abstract I mentioned previously. When I teach this topic, the Heil et al. (2008) and Higgins et al. (2011) articles are the first I refer to, so it's odd that they were not cited here. It also remains unclear what the one UK study of voucher incentives for smoking cessation is. There is much to commend in this study, however closer adherence to published reinforcement protocols in further studies can only serve to boost the potential impact and effectiveness of this unique approach to behaviour change. My colleagues and I have just had a multi-methods imaging study on slot machine gambling published in NeuroImage. The article describes the findings of two studies, one conducted with fMRI and the other with magnetoencephalography MEG, which were part of a large project funded by the Wales Institute of Cognitive Neuroscience (WICN). The NeuroImage article is the culmination of several years' hard work from everyone involved. I can't tell you how relieved I am to finally see it in print! It's certainly been one of the longest duration projects I have ever worked on, and also perhaps the most rewarding because it has taught me the value of interdisciplinary collaboration and how finding answers to the really interesting scientific questions really does require the input of a wide range of subject experts. At the time we started this project, a lot was known about the neurobehavioural mechanisms of the "near-miss effect" in simulated slot machine gambling, thanks mainly to Luke Clark's lab at Cambridge and Mark Dixon's pioneering behavioural work at Southern Illinois (Mike Dixon at Calgary has since down some fantastic work in this regard). The near-miss effect refers to a cluster of findings concerning the neurobehavioural effects of "almost winning". Typically studied using simulated, multi-reel slot machines, near-misses may be defined as a losing display physically resembling a winning display (i.e., two out of three matching symbols on the payout line of three-reel slot). Now, you need three matching symbols to win on a given spin, but 2/3 is deemed closer to a win than, say, a 1/3 display. They are both losses, but the near-miss is subjective and objectively deemed to be almost a win, perhaps due to physical resemblance/generalization. We know that the proportion of near-misses influences gambling persistence (around a third of trials presenting near-misses is generally thought best), that people (gamblers and non-gamblers alike) rate their chances of winning on the next spin higher than following losses, that spins following near-misses are usually initiated faster than after other outcomes, and that physiological arousal to near-misses resembles that of actual wins. Studies by Luke Clark, Mark Dixon and colleagues have individually shown that near-misses evoke activation in ventral striatum, rostral anterior cingulate cortex (rACC), and in reward-related neurocircuitry, such as the midbrain (substantia nigra/ventral tegmental). Even the extent of activation is predicted by gambling severity: indeed, the more severe your gambling problem or history is, the greater the activiation seen in anterior insula (bilaterally) in non-gamblers (Clark et al., 2009) and in the midbrain of gamblers (Chase & Clark, 2010). Of course, there's only so much that fMRI research, with its reliance on the slow haemodynamic BOLD response, can tell us about the brain systems underlying gambling behaviour (I will gladly leave it to others with far better expertise than me to fully explain the issues involved - here and in terms of fMRI vs. MEG, here). Instead, we wished to examine the temporal dynamics and oscillatory changes involved in the near-miss effect and hence chose magnetoencephalography (MEG) as the method to do so. We first measured BOLD-fMRI in a mixed sample of gamblers and non-gamblers and focused on the overlap between activation related to wins and near-misses, and examined the associations with gambling severity and a trait measure of cognitive distortions. We predicted that similar activation patterns would be seen when near-misses were contrasted with losses and when wins were contrasrted with losses. Also, we expected that activitation of the insula to near-misses would be predicted by gambling cognitions. Participants spun the reels, viewed the outcomes and made ratings while lying in the MRI scanner or sitting in the MEG device. We compared separate groups of gamblers and non-gamblers using MEG to investigate induced oscillatory power changes associated with win and near-miss, relative to loss, outcomes. Our focus was on the orbitofrontal cortex (OFC)/ACC and insula regions previously identified in fMRI studies. By using MEG, we were also able to record EEG at different frequency ranges as well. So, on the basis of previous EEG/ERP work, we were particularly interested in whether near-misses would induce greater theta power, in the 4-7Hz range, in gamblers compared to non-gamblers in our frontal and insula regions of interest. All participants were administered the South Oaks Gambling Screen (SOGS) and, in the MEG study, their scores determined which group they were assigned to (gamblers or non-gamblers). 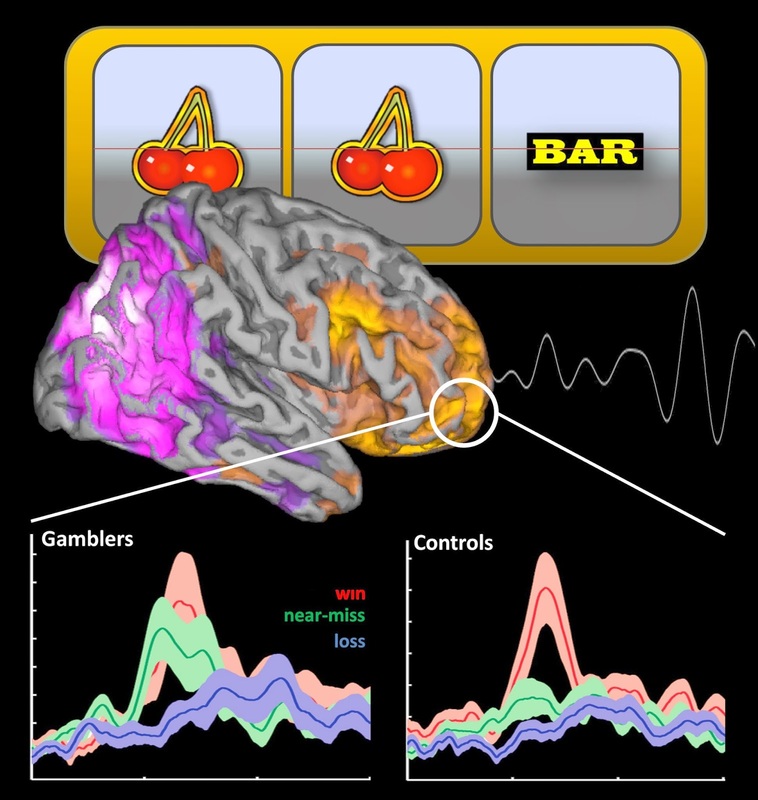 BOLD-fMRI responses in the insula to near-misses were associated with the extent to which participants thought about gambling (GRCS) - this neatly replicates an earlier finding from Luke Clark's lab. Taken together, these data show that the near-miss effect in slot machine gambling is underpinned by increases in theta power in R OFC and insula, and which gamblers are particularly sensitive to, and that such increases are associated with the extent to which someone reports cognitive distortions related to gambling and with gambling history/severity. The hope is that the diagnostic and therapeutic implications of these findings might one day be realised by, for instance, devising interventions to attenuate the neural signatures of this near-miss effect.